The post Mission Rabies Fights Rabies in Both Dogs and Humans by Dr. Arnold Plotnick appeared first on Dogster. Copying over entire articles infringes on copyright laws. You may not be aware of it, but all of these articles were assigned, contracted and paid for, so they aren’t considered public domain. However, we appreciate that you like the article and would love it if you continued sharing just the first paragraph of an article, then linking out to the rest of the piece on Dogster.com. With a mortality rate of 99.9 percent, it’s no exaggeration to call rabies the deadliest disease in the world. There’s a vaccine to prevent it, and, if bitten by a rabid animal, immediate treatment is available. However, if treatment is delayed until clinical signs develop, the disease is fatal. Dr. Plotnick and his Mission Rabies team, including fellow veterinarian Dr. Alyssa Watson Rohnkohl. Human cases of rabies are rare in the United States. Sadly, rabies remains a problem in many underdeveloped parts of the world, killing an estimated 60,000 people annually, the majority of which are children under the age of 15. Most cases of rabies occur as a result of a dog bite. Millions of healthy dogs are inhumanely persecuted and killed for fear of this lethal disease, which does little to stop the spread of the virus. Numerous studies have shown that a combination of sterilization and vaccination of dogs in endemic areas is the most effective, long-term strategy for controlling rabies. Mission Rabies, founded in 2013, is a charity with an ambitious goal: to eliminate canine rabies once and for all. As a veterinarian who has vaccinated thousands of dogs and cats against rabies, I was naturally drawn to the organization, and in late 2018, I joined its team of motivated volunteers. Approximately 95 percent of all human cases occur in Asia and Africa. India is especially hard hit, with one-third of all global human rabies deaths occurring there. In October, we set our sights on Goa, India. Studies have shown that vaccinating 70 percent of the dogs in a rabies-prevalent area controls the disease in both humans and dogs. Our 14-day mission in Goa was simple: Vaccinate as many dogs as possible. 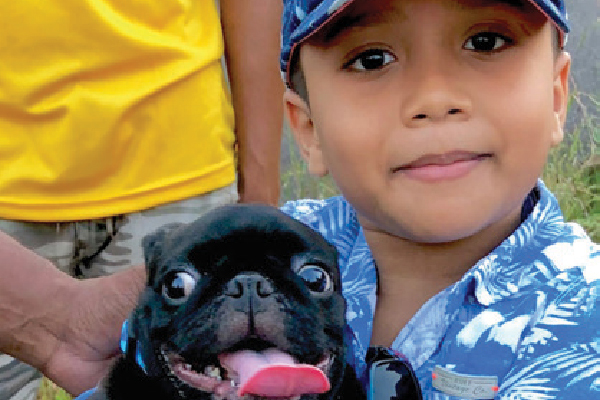 This young boy’s Pug was vaccinated, and the boy given a Mission Rabies wristband. After meeting my fellow volunteers, the teams were assembled. Each team consisted of a team leader (an experienced Mission Rabies member), a vaccinator (usually a veterinarian or veterinary student), a data recorder, a “painter” (the person who marks the dogs, usually on the head, to show that they have been vaccinated) and two to four animal handlers. The handlers are local residents experienced in catching the free-roaming strays that populate the area. Our days began at the crack of dawn. Armed with nets, vaccines, needles and syringes, we canvassed our assigned area. Some days were devoted solely to catching stray dogs. Other days, we went door to door vaccinating dogs owned by the local residents. The mission was a rousing success. During my two-week stint, the teams collectively vaccinated over 5,000 dogs. Although the days were long, the heat and humidity were oppressive, and the work was physically grueling, the entire experience was exhilarating. I met and formed lasting friendships with veterinarians, technicians and other animal lovers from all over the world. The local residents were deeply appreciative of the work we were doing. Mission Rabies began its Goa campaign in 2013. In 2014, 17 people died from rabies in Goa. No one died in Goa of rabies in 2018. Zero. We are making a difference.